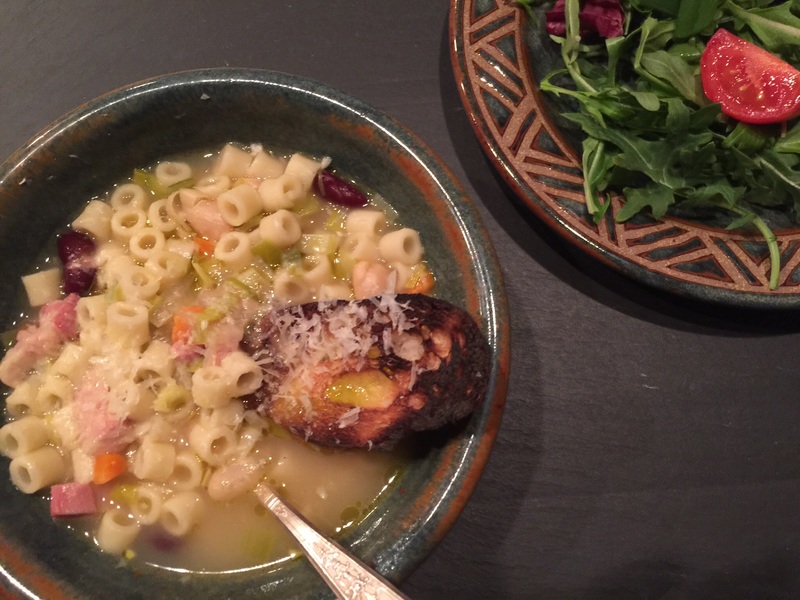 This is an adapted recipe from Giada’s Food Network pasta fagioli. John sautes the pancetta and adds some onion and leek, there’s a bunch of herbs, garlic, and he adds some carrots, the broth, and half the beans. After a little cooking, he adds the ditalini and the Parmesan rinds and finally some puréed beans. With toasted bread, olive oil, and grated Parmesan the soup is finished. We served this with an arugula and tomato salad. This entry was posted in Pasta, Vegan, Vegetarian and tagged beans, canellini beans, ditalini, pasta, soup, Vegan, vegetarian. Bookmark the permalink.